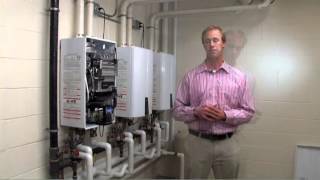 Prestigious Independent School League member saves $20,000 a year in gas, water and electricity costs by switching to a Navien NPE‑240 system. The dining hall at Brooks School, a co-educational college preparatory boarding and day school, in North Andover, Massachusetts, used two inefficient 400,000 BTU boilers to heat a 300-gallon storage tank. With a $1.2 million dollar annual utility bill, the school was looking to reduce the cost of gas, water and electricity by 5 to 10% per year. The old system cost about $2,000 a year for maintenance and repairs — not only for the boilers and the tank — but all also for the corroding metal venting. Due to corrosive water, they had to replace water tanks far too often. Brian Palm, Director of Sustainability and a teacher of environmental science, investigated replacement options for the school. Bob Avila of Avila Plumbing and Heating, suggested using three Navien NPE-240’s to address the issues of operating efficiency, durability and maintenance. The new system was installed over the 2012 winter break. Operating efficiency: Since demand varies greatly depending on the school calendar, Brian appreciates the efficiency of an on-demand system. “We had been heating a couple hundred gallons of hot water at 140 degrees when the school was quiet for three to four weeks,” he explained. Durability: Bob liked the stainless steel heat exchanger. “It doesn’t corrode like other units so it will last a lot longer.” With the new Navien system, there are no water tanks to replace every few years. In addition, the PVC venting not only costs less, it’s easier to install and unlike the metal venting, will not corrode.